The previous post on Ancient Egypt showed some of Khufu’s Great Pyramid at Giza’s external features. Today, we’ll explore its interior. I’m standing in front of the ancient and modern entrances. The big hole is the old entrance. The small one with the line of people is the one you use today. 1. The entrance leads you down a narrow corridor that descends at a 26 degree angle. 2. You come to a fork, with one passage continuing through the rest of the pyramid, and then down through the natural rock at the same angle. It ends at a chamber carved from the rock. It’s incomplete, and a narrow passage leads south from one corner. It thus probably wasn’t meant to be the king’s burial room because his chamber was supposed to be the last one you come to. This underground room remains a mystery. 3. The second passage is the one you use today. It rises at about 30 degrees. It’s only 3 1/2 feet wide and about 4 1/2 feet tall, and is thus a bit difficult to ascend. 4. You come to another fork. One passage is level, and it leads to the second of the three rooms in the pyramid. It used to be called the queen’s chamber, but the name is misleading–Khufu’s queens had their own pyramids, which were much smaller. A small niche is in the wall. Because this room is under the king’s chamber, and because it was totally closed off, it might have been used for the king’s Ka (Mark Lehner, The Complete Pyramids, 2004). This was the component of the soul that energized it. 5. The second passage is called the Grand Gallery, and entering it is a sublime experience. Here the cramped passageway widens to about 6 1/2 feet and soars to 26 feet, with a corbeled roof like the ones in the Red Pyramid. It’s more than 150 feet long, and it ascends at the same angle. I regret that a guard at the pyramid’s entrance made everyone leave his camera with him. This final approach to the king’s chamber is monumental. 6. The king’s chamber is a rectangle about 34 by 17 feet. High up in the pyramid, and presiding over the other two chambers, it’s close to the sun. 7. This room is roofed by 9 long granite lintels. They’re 18 feet long, and vary between 25 and 40 tons. 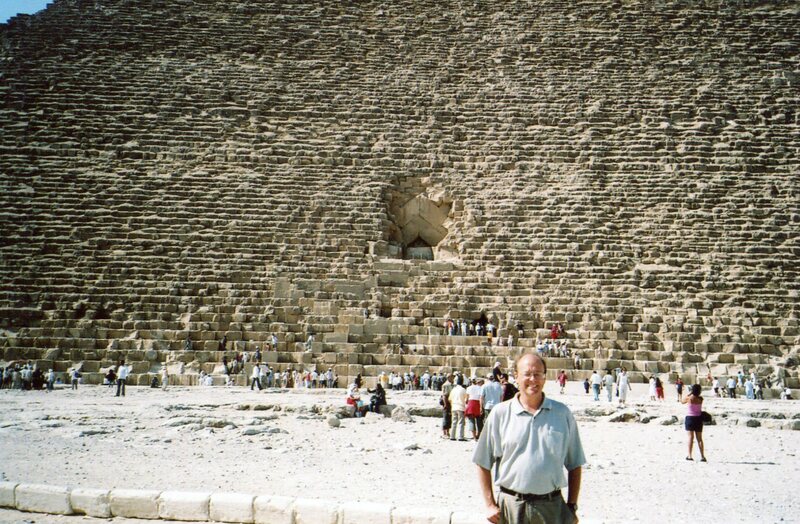 Egyptians had never spanned such a large space in stone before. 8. A granite sarcophagus presides at the far end of the room–it was broken into in ancient times. 9. Narrow air shafts rise from this room (and from the “Queen’s Chamber”) and extend through the pyramid. They’re oriented to the stars, so the Pharaoh’s soul might have risen through them to join the circumpolar stars in their nightly journeys. So the Great Pyramid was used to transform the king’s soul into eternity, and allow it to both rise with the sun during the day, and join the stars at night. But it had other aspects, which I found even more moving. We’ll explore them in the final post.